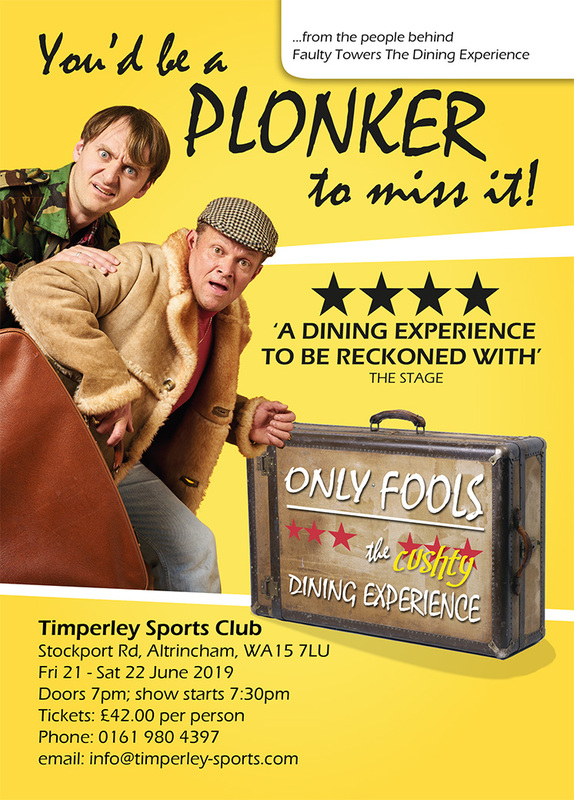 -it’s the show they were all asking for, and it’s by the people behind theworldwide smash hit, Faulty Towers The Dining Experience: Only Fools The(cushty) Dining Experience opened in the UK in September last year and it’salready winning fans. Now it’s coming to Timperley Sports Club in June 2019! Transporting guests to The Nags Head forsome wheeling, dealing and eating, this fully immersive, highly interactivetheatre show makes for a t’riffic night out – you’d be a plonker to miss it! The Trotters want to drum up some cashand make a cheeky saving on the side in this fun-filled knees up that haseveryone stopping by – including fan- favourites like Cassandra, Trigger,Marlene, Uncle Albert and more. Mayhem rules from start to finish as deals arebrokered, schemes are hatched and quizzes quizzed. This fabulously new, completely uniqueexperience is a bang-for-your-buck event that includes shed-loads of laughs.One-off improvisation, side-splitting humour, and an expertly-crafted,completely original script come together to make this loving tribute to the TVseries a high-quality, seriously funny night to remember.